Metal detectors and body scans—not just for airports any more! 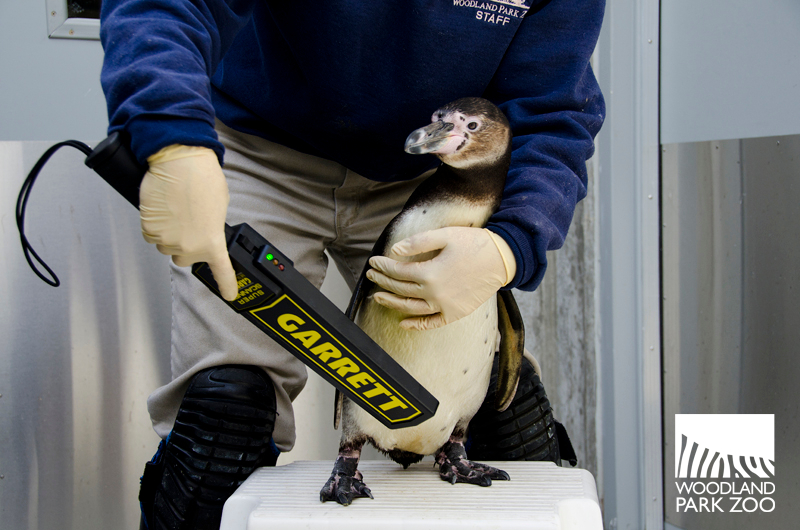 This is the story of how a penguin’s life was saved by these technologies right here at Woodland Park Zoo. TSA gone too far? Nope, just a zookeeper demonstrating how we use a metal detector on penguins. Photo by Ryan Hawk/Woodland Park Zoo. Last week, zookeepers observed that one of our penguin juveniles was not feeling well. Diablo, hatched last year, had not been eating regularly and was losing weight. Diablo’s keepers suspected he may have ingested a foreign body that was causing blockage for him. So they brought him behind the scenes and used a metal detector wand to determine if he had ingested any coins or other metal objects. Trust me, it’s not easy metal detecting on a penguin! You have to be careful to hold the penguin away from anything that might give a false positive, and penguins, well, they can fidget. But sure enough, once the keepers got Diablo into place and waved the wand over him, they heard a beep. To get a better look at what might be inside him, keepers took Diablo over to our Animal Health Complex for an examination. 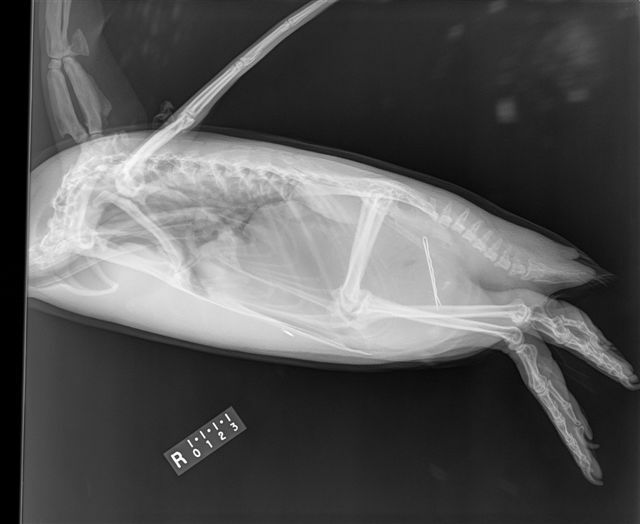 Our vet team x-rayed the bird and the radiographs revealed the distinct shape of a bobby pin inside Diablo’s gastrointestinal tract. Animal health staff decided to immediately move forward with a procedure to remove the bobby pin as Diablo was already immobilized under anesthesia for the radiographs. We inserted an endoscope into Diablo, identified the exact location of the pin and removed it. The entire procedure took about an hour to complete. After the procedure, Diablo began to show signs of improvement. We put him on antibiotics to ward off infection, particularly because the bobby pin showed some signs of eroding and had gotten quite sharp, which had the potential to cause internal lacerations. 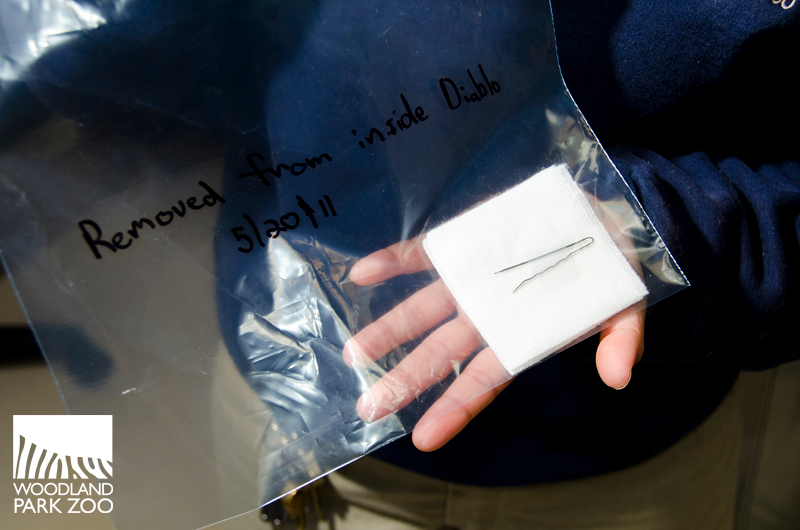 The pin after it was removed from Diablo. Photo by Ryan Hawk/Woodland Park Zoo. Just under a year old, this is Diablo’s first serious experience with ingesting a foreign body. 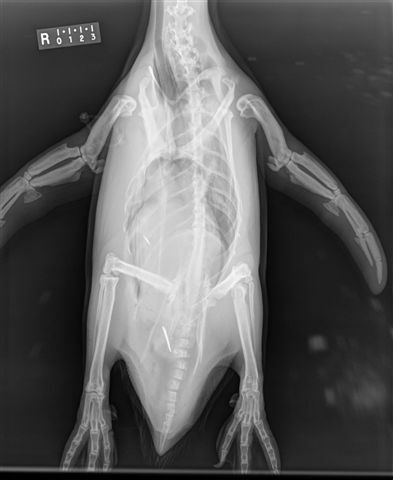 But it is an ongoing concern for the keepers, since penguins are curious animals and have a tendency to examine, manipulate and consume novel items. Zoo staff vigilantly checks and clears the pool of any foreign objects. 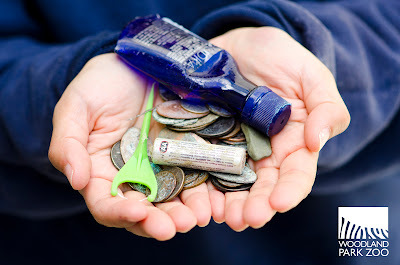 You can help too by being sure to never discard anything into a zoo exhibit or litter on zoo grounds (your litter can easily blow into an animal’s space). And please, please do not toss coins into any zoo pool. We imagine this bobby pin got into the pool by accident, but we ask that you respect the barriers of the exhibit so that you lessen the chance of dropping anything in by accident. 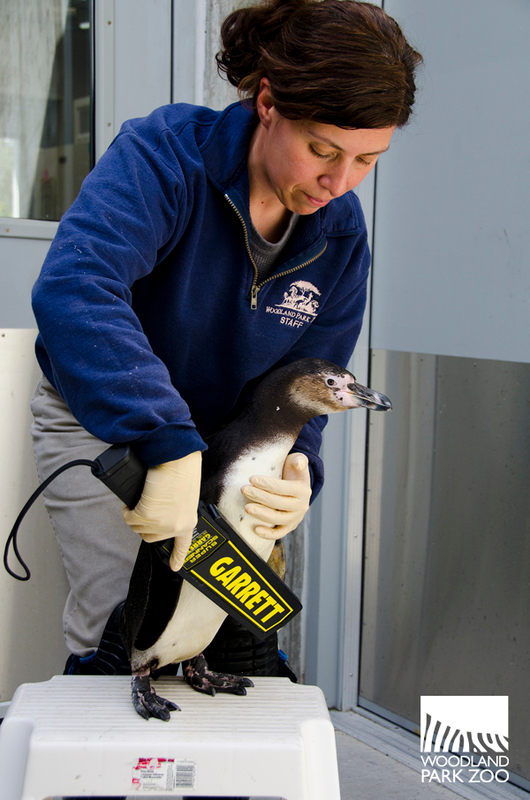 Zookeeper displays items that have been recovered from the penguin pool. Photo by Ryan Hawk/Woodland Park Zoo. Diablo is back on exhibit now recovering quickly, and the metal detector is back on its shelf, ready to save another life if needed. So next time you are stuck on an interminably long security line at an airport, think of Diablo’s fortunate outcome thanks to these technologies and maybe you won’t feel quite so frustrated.